In their response to HIV, many countries have adopted and enacted policies to reduce transmission and increase HIV-related service use. Theoretically, policy-level interventions for HIV prevention have the potential to improve health behavior outcomes. These policy interventions vary in their scale, from relatively minor changes in clinical policy to major national legal initiatives. Assessing the effectiveness of HIV policy interventions is a challenging undertaking. While many policies exist and guide HIV programmes, relatively few have specifically been evaluated for their effects on reducing HIV risk taking or increasing HIV health-seeking behaviors. Thus, questions on the effectiveness of policy interventions to prevent HIV and change HIV-related risk behaviors remain largely unanswered. 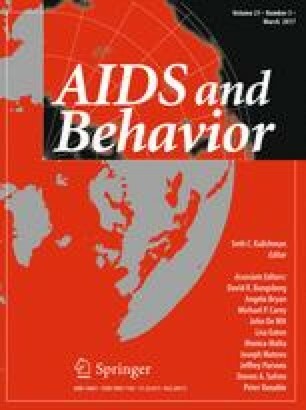 To address this current gap in the literature, we systematically reviewed the existing evidence on the effect of HIV policy interventions on changing HIV-related behaviors in low-and middle-income countries. K. O., V. F., C. K., and M. S. developed the initial study design and protocol. V. F. oversaw the search and data abstraction process. E. A. analyzed the findings and wrote an initial report of the findings. K. O. wrote the manuscript. All authors collaboratively discussed key decisions through the course of the review, provided critical feedback on preliminary drafts and interpretation of results, and approved the final manuscript. The US National Institute of Mental Health supported this research, under Grant Number 1R01MH090173. None of the authors reported any conflicts of interest. This article does not contain any studies with human participants or animals performed by any of the authors. The research proposal was reviewed by the Institutional Review Board of the Medical University of South Carolina and given an exemption. World Bank. Country and lending groups. http://data.worldbank.org/about/country-classifications/country-and-lending-groups.